Iranian security stand guard to protect Saudi Arabia's embassy in Tehran, Iran, while a group of demonstrators gathered to protest execution of a Shi'ite cleric in Saudi Arabia, Jan. 3, 2016. Iran's supreme leader says Saudi Arabia will face "divine revenge" because of its execution of Sheikh Nimr al-Nimr, a prominent Shi'ite critic of Saudi Arabia’s ruling royal family. Ayatollah Ali Khamenei said Sunday "The unjustly spilt blood of this martyr will have quick consequences." The supreme leader said Nimr "neither encouraged people into armed action nor secretly conspired for plots, but the only thing he did was utter public criticism rising from his religious zeal." Iran's Revolutionary Guard said in a statement Sunday Nimr's death would lead to the "downfall" of Saudi Arabia's monarchy. The Guard described Nimr's execution as a "medieval act of savagery." Nimr's execution has caused international outrage and a serious escalation of diplomatic tensions in the region, with unrest predicted in Shia-majority areas. Nimr, who was among 47 people executed Saturday in Saudi Arabia, was a widely revered Shi'ite Muslim cleric convicted in 2014 of sedition and other charges and sentenced to death. He was an outspoken critic of the kingdom's ruling al-Saud family and a key leader of Shi'ite protests in Saudi Arabia in 2011. U.N. Secretary-General Ban Ki-moon said he was "deeply dismayed" by the execution of Nimr and the 46 other people, and called for "calm and restraint in reaction" to the executions. The U.S. warned that Nimr's death would only add to strife between religious sects in the region. "We are particularly concerned that the execution of prominent Shia cleric and political activist Nimr al-Nimr risks exacerbating sectarian tensions at a time when they urgently need to be reduced," U.S. State Department spokesman John Kirby said Saturday in a statement. Shia-majority Iran, which made frequent requests to the Saudis to pardon Nimr, had some of the strongest reaction to the news, saying Saudi Arabia would pay a high price for the execution. Iran’s Foreign Ministry spokesman, Hossein Jaber Ansari, strongly attacked Saudi Arabia for ramping up sectarian tensions in the region. The speaker of the Iranian parliament said Saudi Arabia, which is founded upon an ultraconservative Sunni ideology known as Wahhabism, would face a "maelstrom'' from which it would not escape. A man shouts anti-Saudi slogans as he takes part in a protest against the execution of Saudi Shi'ite cleric Nimr al-Nimr by Saudi authorities, in the village of Sanabis, west of Manama, Bahrain, Jan. 2, 2016. Iran also summoned the Saudi envoy to Tehran to protest Nimr's killing. Soon afterward, protesters stormed the Saudi Embassy in Tehran, smashing furniture and setting fires before being cleared out by police. Soon after, protesters stormed the Saudi embassy in Tehran, smashing furniture and setting fires before being cleared out by police. Authorities said Sunday 40 suspects have been arrested in connection with the rampage. Tehran's prosecutor said an investigation is ongoing and more arrests could follow. 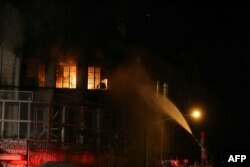 Water is sprayed on a fire set at the Saudi Embassy in Tehran during a demonstration against the execution of prominent Shiite Muslim cleric Nimr al-Nimr by Saudi authorities, Jan. 2, 2016. A top Shi'ite cleric in Lebanon warned there would be a backlash because of Nimr's execution. Sheikh Abdul-Amir Kabalan, said, "This is a crime at a human level and will have repercussions in the coming days." Iran and Saudi Arabia have been vying for leadership in the Muslim world since Iran's 1979 revolution, which elevated hard-line Shi'ite clerics to power. The U.S. war in Iraq further enflamed religious and ethnic tensions by leading to a Shi'ite-led government in Baghdad and a crucial shift in the sectarian balance of power in the region. 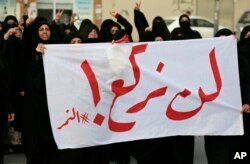 Bahraini protesters carry a banner reading, "We will not bow! #alNimr," during a demonstration against Saudi Arabia's execution of Shiite cleric Sheikh Nimr al-Nimr, in Daih, Bahrain, Jan. 2, 2016. After Arab Spring protests erupted in 2011, Saudi Arabia and Iran entered into a fierce proxy war in Syria, where they support opposite sides of the conflict, and in Yemen, where Saudi Arabia has been bombing Iranian-allied rebels since March. They also support opposing political groups in Lebanon, Iraq and Bahrain. Protests over the Nimr execution were held in Bahrain, where police used tear gas on the crowds, as well as in India and outside the Saudi Embassy in London. More demonstrations were being planned for Sunday in Lebanon and Tehran, where the majority of outrage is expected to be focused.